This could be the last dance for Major League Baseball 2K. For more than a year, all signs have pointed to Take-Two Interactive, the parent company of 2K Sports, leaving a licensing deal many have ridiculed from the day it was signed in 2005. 2K Sports has ended three team sports series in the past seven years. Is MLB 2K12 a swan song on the order of NFL 2K5? Or is it more in the range of NHL 2K10? This will be my second review under a new format, so I feel like I should reintroduce it. Sports video games, especially, are engineered to appeal to and sustain many different tastes. That makes appraising one's overall quality tough, because what didn't resonate with me may be someone else's primary reason for picking it up, and vice versa. This, then is a list of this game's 10 most striking features or qualities, ranked in descending numerical order (or ascending order of preference) of what they contributed to my enjoyment. Hopefully, in these descriptions, you may form your own picture of MLB 2K12 and how much it would appeal to you. 10. Framerate drops the ball. The most glaring defect in MLB 2K12 is a horrible framerate drop after the batter makes contact. It happens on the first pitch, it will happen on nearly every pitch. The fact the execrable MLB 2K9 also suffered from framerate problems almost makes this a backbreaking regression. My haphazard guess is that the game's new batting outcome logic, which creates a greater variety of hit direction and distance, is overwhelming the CPU. Whatever the case, some foul balls will play out as jaggedly as if you shot an exploding barrel in a room full of 16 enemies. It is definitely the most unwelcome surprise coming out of an on-location preview that was generally positive. WHY: It's still the only Major League Baseball game on the Xbox 360. That's not a hell of an endorsement, but MLB 2K12 is an improvement over MLB 2K11 in gameplay. Its visuals are plainly a disappointment, though. Type of game: Sports simulation. What I played: Played an entire postseason mode; played 1.5 years of the singleplayer "My Player" career mode. Simulated an entire season to analyze the trade and stats logic, playing about a dozen games out of it. The best game for pitching. Career mode gets a huge boost thanks to more realistic expectations and progression. Terrible framerate drop at the moment of bat-on-ball contact. Poor visuals and birdbrained animations take you out of immersion almost immediately. 9. She ain't much to look at: New face models have made star performers more recognizable and uniform numerals, strangely, seem to have been fixed between the preview and what I'm playing right now. But there is a long list of visual upgrades MLB 2K12 has needed, for many years, and it didn't get them here. Uniforms are very flat and some colors are oversaturated—the Yankees' and Tigers' caps are almost Dodger blue to my eye. 8. What am I watching? The sidecar to the game's disappointing visuals are the bizarre animations MLB 2K12 still delivers, despite repeated promises that more interactions have been added and existing ones have been refined. There still is a ton of players standing around on the balls of their feet in the "player ready" pose, which I was told had been resolved last year. On a home run, bot outfielders will frequently run away from the trajectory of the ball and then stand there, looking at the wall, in player-ready. There's a lot of stop-and-start to baserunning animations. Visual concepts added some catcher interactions to improve the realism, but the catcher fires the ball back a split second after receiving it, even if it's a 59-foot curve in the dirt with no one on. These are extremely nitpicky things, but echoing a big complaint I had last year, MLB 2K12 will still do a lot of things that remind you you're playing a video game, not watching a baseball game. 7. Winning it less than all: For a game with very strong presentational qualities, the fact its postseason plays behind the same unacceptably thin window-dressing is a disappointment that needs to be called out. You'll only know it's the playoffs through the commentary, and even then it comes only before the first pitch and at the final at-bat. Why this game would include a dedicated playoff mode—something MLB the Show does not offer—and give it next to no presentational depth, is poor planning or allocation of resources. See the video to understand how insubstantial the payoff is. It's the same as last year's. 6. MLB Today Season: This feature goes this low on my list only because we haven't begun the season, so the actual value of "MLB Today Season" isn't yet apparent. What it does is blend the game's MLB Today setting—which allows you to play the matchups of the day with the lineups and pitchers expected to take the field in real life—and string all of those games together in a persistent experience. Thus you won't be rewriting one day's poor result, you'll be able to run a virtual season alongside your favorite team's. It would seem to me that this feature will be most valuable if you lag the real world by about 10 or so games—enough both to play with the actual personnel and lineups used in real life, but also to see that disastrous road trip coming and try to undo it. It's a feature that will mostly prove its worth in September as teams fade and their fans take to their consoles to soothe the pain. But in theory, it's a welcome addition to a solid feature. Though it includes a new playoff format finalized only on Friday, the postseason presentation support in MLB 2K12 remains bland. CUTLINE. 5. The new playoff format: On Friday, Major League Baseball and its players agreed to expand the postseason to 10 teams. MLB 2K12, quite presciently, shipped with postseason options that allow for this new format. You can't revert to the old eight-team format, but that matters little. You'll be able to play your favorite team in a playoff format certified 72 hours before the game's release—without a postrelease patch—and that deserves a tip of the cap. 4. Sensible surprises: I simulated a full season to check the franchise mode's trade and stats logic. Cole Hamels was shipped out of Philadelphia at the trading deadline (to Texas). The two sides are currently far apart in contract talks, so this makes sense. The only shocker was second-year pitcher Everett Teaford of the Royals coming up with an Elroy Face-esque 18 victories and zero defeats in zero starts. That would tie a record for wins in relief. It is not as incredible as it sounds. Sixteen times since 1901 has a reliever won more than 15 games without a single start, though most recently in 1978. And as baseball has changed, with 20-win seasons becoming more rare, those 18 victories would make it the first time a relief pitcher has ever led his league in wins. A lot of the enjoyment of a baseball season is in these kind of oddball superlatives, and I think it's a plus that MLB 2K12 was able to create something like this within a well balanced season otherwise. 3. My Player, Please: This mode gets a huge boost thanks to what feels like a rebalancing of My Player, the game's single player career mode, and my most preferred mode of play in baseball. MLB 2K12 gives you a much more sensible appraisal of your progression and value to your franchise than in previous editions. In past years, I could make the majors straight from double-A by the September call-ups at the latest. This time, I was nowhere close, even at the start of my second year. And I didn't deserve it. New player roles—slugger, contact hitter, strikeout pitcher—give you a modified attribute set when you start. Pitchers created as starting pitches will actually be starters, eliminating the tedium of earning your way into the staff and, more importantly, giving you the opportunity to earn more skill points to develop your player. New pitchers definitely should boost their stamina attribute first, as it keeps you in the game longer, which translates to more point-earning chances. You can still bite off a single season in a day, but it means a lot more knowing the game won't cater to you as it did in past editions. 2. Overall Balance: You have to overlook the poor visuals and the framerate drop—and those are huge defects that are in your face with every pitch. But in strict gameplay, MLB 2K12 performs very smoothly and authentically. User fielding is a lot cleaner than last year's game, even if some of the bot animations take a long time to load up the throw. Hitting has come very far from the game's days as a shooting gallery full of gappers and home runs, and its dependence on timing feels deterministic, not random. The "Max Pitch," which is when you time the pitching meter perfectly, is harder to achieve even with top performers, and absolutely rare with lower rated hurlers. It's not the prettiest date, but MLB 2K12 is at least a graceful dancing partner. 1. Still Makes a Strong Pitch: I have always felt that, for all of its shortcomings, MLB 2K is the most enjoyable baseball pitching game available. They pressed into the area of deterministic analog controls first, against the grain of the pitching meter everyone was raised on. The new mandate to mix pitch variety and location provides another smooth layer of authenticity. I felt it was a little rigid with my low-rated minor leaguer—I had to pitch to the catcher's recommendations or else I got whacked solid. But with a fully developed major leaguer it is a delight early in the game and a puzzle in the late innings, especially if you're trying for the shutout. You can beat a hitter with a suboptimal pitch, but you will need to know the bias in your pitcher's accuracy as he wears down, have superb timing, and not throw it to an area where the ball can be driven hard. That's basically pitching in real life. 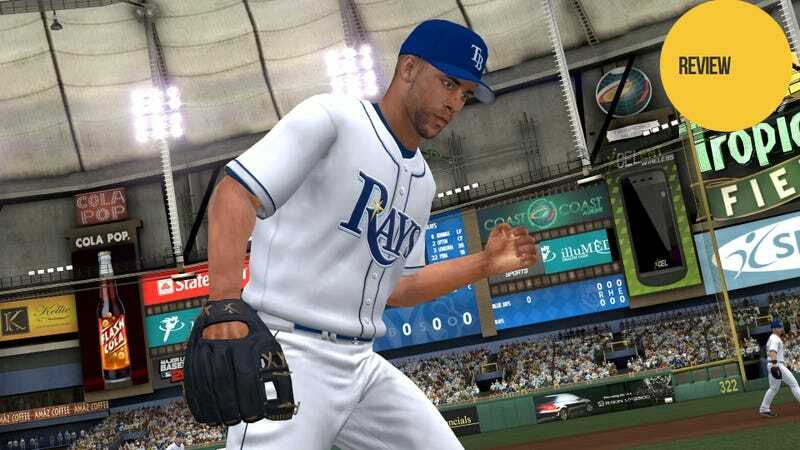 MLB 2K12 is not the guns-blazing finale we would all like it to be. Its poor visual and animation quality, which is a bedrock expectation in the simulation sports genre, hurts its appeal immensely. It's still a solid performer in the realm of gameplay, with a number of features that improve the gameplay experience, even over its competitor on the PS3. For me, the worry is not what will become of MLB 2K. Any fair analysis would agree that this product has been mismanaged and has underdelivered on its promise since 2K Sports signed its first deal with Major League Baseball. My hope is that what the game did bring to simulation baseball—chiefly in its replication of a real-world season, and in the fair and fully involved pitching mechanics it offers—lives on, if not in this series, then somewhere else.